Once again I have to apologize for the delay on the post. It is like waiting for the sequel to a Harry Potter Book to be released- but maybe a little less exciting. :). I had gotten very little sleep- my upset stomach was escalating. I had spent a fair amount of time in the bathroom in the middle of the night. There literally was only a shower curtain for a door. Meanwhile Pam was sleeping on a mattress on the floor about 3 feet from the bathroom. I had eaten next to nothing but still managed to have 5 bouts of diarrhea in the middle of the night. When it came time to eat breakfast on the supply boat- I had no desire to eat. I literally couldn’t force anything down. I was trying to make the most of my day. I asked if I could go to shore to cheer for our teams as they took off. They said yes- but I didn’t have a ton of faith that I wouldn’t be left on shore- so I watched them take off and then quickly got back on the boat.It was a very bittersweet moment- watching them begin the final leg of the race. I was still really struggling with the fact that I had decided to not complete the race. I was dreading the fact that going to the bathroom was awkward on the supply boat- I had to ask people to let me into their room so that I could use the bathroom. And I was concerned as to how often this was going to be. I did make sure to have a roll of toilet paper with me- so I didn’t have to ask for that as well. On The Police Boat- Making the most of it! We were barely done giving me the medicine when the Police boat comes up with a very sick paddler. I was shocked and horrified to discover it was my team mate Steve. I was so incredibly worried. I didn’t know what was wrong with him at first- He was barely conscious. He was overheated and couldn’t cool down. They gave him electrolytes to sip (just like with me). I remember how scared I had been when I was really sick on my Sea lion trip in Lima. I was glad I was there- to hopefully make it less scary for him. It took Steve a long time to recover. There was a time that they weren’t sure if they were going to need to get him to the hospital. 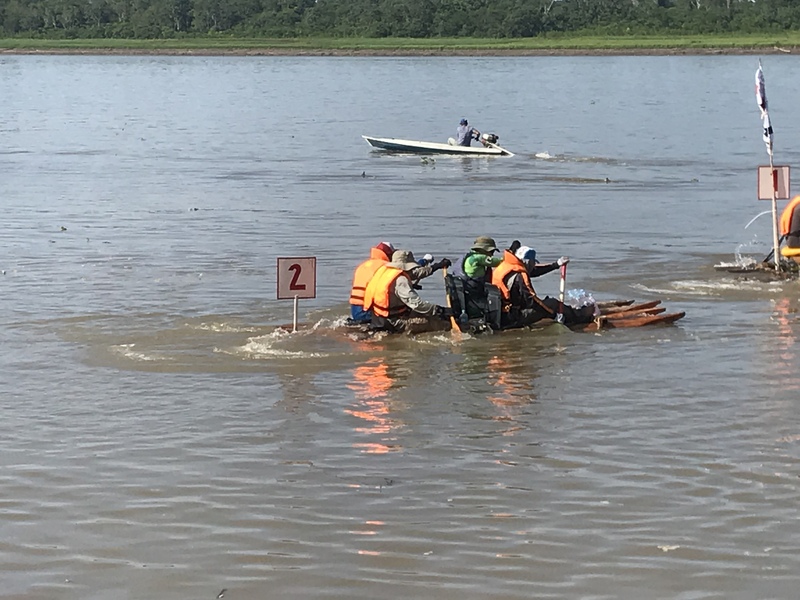 Meanwhile we went back and forth along the race course- making sure all the paddlers had water and were okay. The only two people in sick bay today were from my Raft. I considered it to be my job to cheer on the paddlers. So when I would come to a raft- particularly the 2 teams in our group- I would cheer wildly- sometimes it bothered Steve- so I had to keep it down. The end of the race is a very difficult upstream paddle. Only two teams were able to complete it this year without being towed in. The conditions were extremely tough this year. It is a brutal way to finish the race (So- I have been told). When the racers arrive in Iquitos it is one Huge Party. There are many locals who come out to see the rafts come in and take part in the celebration. They provided one last meal and There is a bar with Beer and Sodas available for Purchase they announced the winners and there was dancing and a huge Celebration. There is Prize Money awarded- it is a huge deal to the locals to win. Most international teams donate. My team came in 2nd even though they only had 3 of their 4 Paddlers remaining. There had been some question as to whether or not this would disqualify them. But there was a question- we started off as an international team but ended up as a Regional Team. There were 3 international participants and 2 local participants. But at the finish line 2 locals and 1 international. Are you confused yet??? I know that in the end the placement of all the participants was very confusing. I am just glad that we all made it! I am proud of what I accomplished but I have trouble thinking about the race without a heavy heart. I know that things happen for a reason. I will never forget that moment on the first day when we arrived and I had done it. The tears of joy- that I had survived the day. Not everyone can say that they went and faced all the scary things in the Amazon River in the Sweltering heat. I paddled a raft that I helped to make (slightly). It was a experience of a lifetime. It wasn’t the race I had envisioned. Isn’t that life-it’s never quite what you think it is going to be. Isn’t that half the fun. Half the adventure??? I know this is just one Adventure for me. I know without a shadow of a doubt – there are many more to come. I’m glad you were able to describe this day which was one of the most disappointing times of your Amazon Adventure. It wasn’t so much fun to relive that experience, but it’s probably an important part of the healing process. I’m glad to know more details about what happened on the final day of the race. Now the depressing part is behind you, and it’s time to write about a more upbeat adventure. Have you started planning your next big adventure? You need something to look forward to. The time to reflect on this race has been good. Yes part of the process. I haven’t quite decided my next adventure. But working on it! Thanks Sarah. I’m proud of you for going on this trip. And proud of you for dropping out before something terrible happened. You are a strong person. That means a lot to me! It was a hard decision and it is one of those tough choices in life. But as you keep encouraging- I am beginning to see the thinks that we’re successful! Thanks for all your love and support!